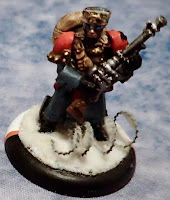 A warmachine blog mostly about Khador. 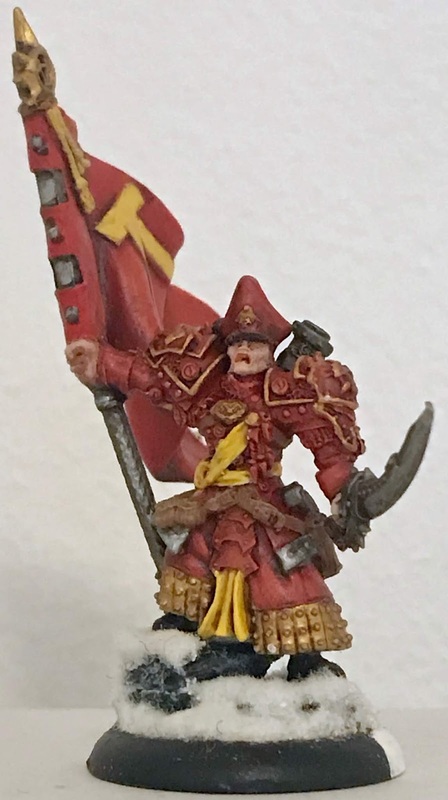 Today's tip: How do I know which unit this random Winter Guard belongs to? There are currently more that 50 Winter Guard models on the table when Irusk commands his WGK list. This is a well and good during deployment, and perhaps during the first turn. But what to do later on when the table is a complete mess of Winter Guards from six different unit all mixed up? I have opted for coloured base markings, here is how and why. What better way of warming up to easter than Ossrum and all of his bunnies? Irusk could think of several things. This is a battle uphill from the first second. But following the spirit of exposing Irusk and his Winter Guards to everything and anything, it had to be tried. Irusk faces the new black for Skorne, double Immortal party pack. This time under the command of Makeda & the Exalted Court. The battle is a slaughter of both Immortals and Winter Guards. Despite it going down hill for Irusk, he manages to pull through, is saved by the bell and manages to pull off a win. The wurm is restless, and Iona is bringing her Tharn into Khador territory. Irusk is called upon to stop the flow of beasts. He brings his Winter Guard Kommand list, despite that perhaps not being the best choice against Tharn. It is an uphill battle for Irusk, yet he almost makes it. However, Iona emerges victorious. The dragon spawn are moving into Kadorian territory and threatens the general population with their unnatural presence. Irusk is called upon to eradicate theses monsters. Despite the Terror of Everblight bringing no less than three huge monsters, Irusk and his trusted Winter Guards are triumphant. Irusk once again has to fend of the insurgents coming out of Ord and disturbing the general population in Llael. Encouraged by earlier success, Mackay and her little tank is once again trying her luck. However, Irusk is a well seasoned veteran and he is not to be played twice. This time Irusk and his heroic Winter Guards are victorious and kills Mackay. Once again the dissidents from Llael are stirring up trouble and disturbing the Empress' peace. Irusk is dispatched to keep the peace. This time Irusk is neck to neck with Mackay in her little tank. However, Irusk and his Winter Guards are unfortunately beaten by the clock. Irusk2 is still a Winter Guard's best friend and Stalingrad-style lists are fun. However, over time Irusk has learned that the original list had its downsides. First and foremost, there is a lack of ARM-cracking ability. This is an attempt to remedy some of the problems, by changing the list to include the Greylord Adjunct and the triple Marauder battle group. The elves are restless tonight. Goreshade has brought some of his brethren into Khadoran territories to hunt for innocent potential warcasters to the Empress army. Irusk brings his trusted winter guards to deal with this menace. This list decimation of the Ios forces. However, once a Helios digs in, it proves very difficult to remove. Irusk has been send to investigate the uprising of the dissident Khador faction from Llael, currently hiding in Ord. A winter guard kommand (WGK) group is dispatched. This is probably one of the worst match-ups for winter guards and Irusk2. But as part of the ongoing test of the Irusk2 and WGK, this should also be tested. It will probably not come as a surprise that Irusk came out on the loosing side. I have been playing Warmachine since the early part of this millennium, and playing other miniature and role playing games for a life time. Since I started Warmachine, it has mostly been this. Other systems just don't seem to cut it anymore. I am a mediocre player and mediocre painter. Yet, I have a lot of fun doing it.